Manned Spacecraft Design Principles presents readers with a brief, to-the-point primer that includes a detailed introduction to the information required at the preliminary design stage of a manned space transportation system. 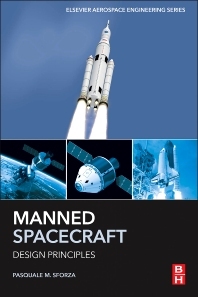 In the process of developing the preliminary design, the book covers content not often discussed in a standard aerospace curriculum, including atmospheric entry dynamics, space launch dynamics, hypersonic flow fields, hypersonic heat transfer, and skin friction, along with the economic aspects of space flight. Key concepts relating to human factors and crew support systems are also included, providing users with a comprehensive guide on how to make informed choices from an array of competing options. The text can be used in conjunction with Pasquale Sforza's, Commercial Aircraft Design Principles to form a complete course in Aircraft/Spacecraft Design. A great read - informative and well written. This is an excellent tour of both conventional launch vehicles and space plane type applications. The author does a good job of explaining the physical principles, then presenting 'quick' approximate methods, followed by a discussion of more in-depth computational techniques where appropriate. I work in the space industry, and would thoroughly recommend this book to both engineers working on real projects and aerospace students. I've used it on several occasions to good effect.